Delicious chocolate fudge whirls filled with a creamy peanut butter caramel. This easy recipe has just 4 ingredients and takes minutes to make, with some cooling time while the chocolate sets. Suitable for dairy free, vegan, gluten free and refined sugar-free diets. I used a very dark 85% cacao chocolate to make this peanut butter fudge. This chocolate is dairy free and relatively low in sugar, so still fits in with our “healthy lifestyle” motto as dark chocolate has many nutritional benefits and is high in antioxidants. You can make it from whatever chocolate you like but I love the really dark bitter chocolate with the sweet caramel of the peanut butter. If you like salted caramel then make it with salted peanut butter. This chocolate peanut butter recipe is high in fat, but it’s natural fats from whole foods that haven’t been mucked about with chemicals and one small piece may be high in calories but it’s very satisfying. If you’re not a fan of peanut butter just replace it with any other nut butter like cashew butter or almond butter and this fudge will work great. The peanut butter fudge centre was very soft and gooey – it tasted great but is a bit sticky. To make a raw food version of this chocolate peanut butter just replace the peanut butter with any other nut butter and use raw chocolate or powdered cacao, date syrup and more coconut oil for the chocolate shell. This recipe was a bit messy but well worth the mess in the end. I would recommend keeping a towel on hand to wipe your fingers as peanut butter is very sticky! Remember fats are not the enemy and our brains would not function without fat. Fat does have an unfortunate name, read my article Does low fat make you fat? You can make this chocolate peanut butter fudge totally oil-free by replacing the coconut oil with coconut butter. My recipe for coconut butter uses just whole coconut to make a wholefood butter that retains all of the fibre. It took three attempts to make this peanut butter chocolate fudge work, mainly due to getting the right amount of chocolate and coconut oil or butter. If it is not malleable to roll (it can vary due to the type of chocolate) just re-melt and add more coconut oil. You will notice in the video the peanut butter looks different as for one of the batches I used chunky with the skin on and the other smooth, but any type will work – the peanut butter is not the issue with perfecting this one. Peanut have lots of health benefits as they are high in plant protein and vitamins including biotin, copper, manganese, niacin and folate. However it’s best to have peanuts in your diet as just one of many nuts and not just have peanuts as the only nut you consume. Even though peanuts are technically a legume as they grow underground in a pod. Melt the chocolate gently in a bain marie (double boiler) and then stir in the coconut oil/butter. Pour into a lined pan, about 8″ in size. Place in the fridge for 15-20 mins until the chocolate is firm but is still soft enough to roll. Check every 5 mins. If you let it firm up too much put somewhere warm for 5 mins. Mix together the peanut butter and sweetener. Add the right amount of sweetener that suits you, I usually add 4 tbsp of maple syrup but you may need less depending on the type of sweetener and butter you are using. Pour the nut butter caramel over the chocolate and roll up into a cylinder. Place in the freezer for 10 mins and then slice the chocolate peanut butter fudge. Wipe your knife in between slices to keep it looking clean. 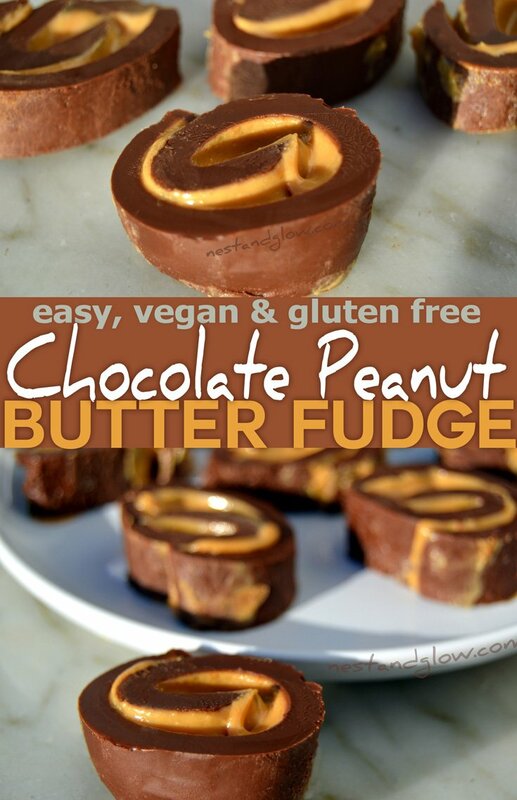 Consume peanut butter chocolate candy within a week and keep in the fridge.